Lemon Verbena. In warmer areas, salvias can be used in open shade, where they work well with nicotiana and sprawling petunias. 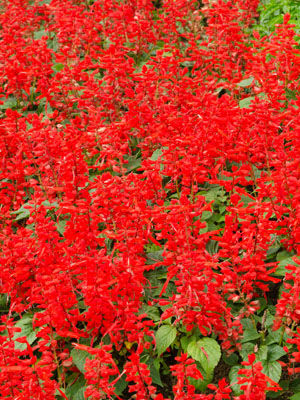 In containers, a single salvia can serve as the upright element, surrounded by mound-forming herbs or trailing flowers. Salvias love warmth but not drought. Provide plenty of water, and be generous with liquid plant food. Red is the most common colour, but varieties are available in numerous colours and bicolours. The tubular flowers attract hummingbirds.